Do you want to improve focus, confidence and your ability to manage anxiety and pressure? Do you know how to relieve stress during a pressure moment in competition? Do you have the skills to quickly and effectively refocus after a setback or mistake? These are some of the key skills that are essential for a more controlled, consistent and optimal performance. If you need help in any of these or other areas of your mental and emotional game or if you simply want a competitive edge then Anna’s peak performance programme is for you. As an Olympian and 6-x World Champion Anna understands the challenges and barriers to elite performance and she brings a wealth of personal experience and expertise, having been there and done it and now trained in it. The programme provides athletes with simple, yet very effective techniques for improved performance. 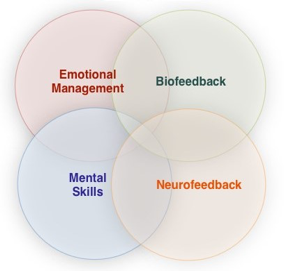 By combining emotional management and mental skills training with objective measurement from biofeedback technology, athletes can quickly learn to alter their emotional, mental and physiological state to perform at their best under challenging conditions. Anna is one of a few sports performance coaches in the UK trained in the specialist area of Biofeedback and Neurofeedback (Anna trained at the Toronto Institute of Biofeedback). This specialism that uses cutting edge science and technology enables Anna to monitor an athlete’s muscular tension, stress levels, brain states, respiration and heart rates and provide tangible evidence to the athlete. Anna then teaches the athletes how to apply a range of techniques to manage these different challenges and ultimately produce a consistent high level of performance. Olympic athletes/teams (particularly in USA and Canada), professional golfers (e.g. Jason Day and Justin Rose), footballers (teams including Chelsea, Manchester United, AC Milan and Barcelona FC) and tennis players (e.g. Novak Djokovic and Milos Raonic) are now using biofeedback and neurofeedback and applying these scientifically proven techniques to consciously train and control their body and mind for optimal performance. Skill acquisition together with real-time objective biofeedback empowers athletes, builds confidence and gives them greater focus in their preparation and performance.